ALWAYS SAVE YOUR CHANGES AT THE BOTTOM OF THE PAGE! Start – Nothing to do here. This is just a general introduction. 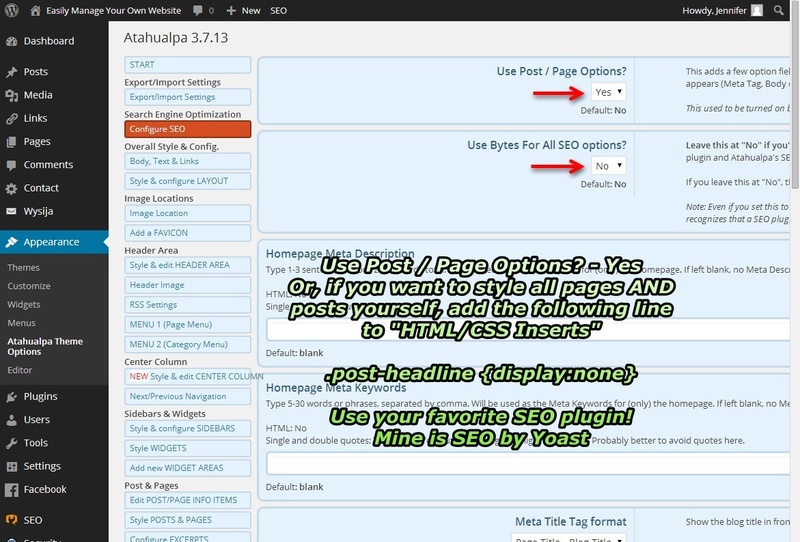 Export/Import Settings – Use for transferring your Atahualpa Theme Options (ATO) settings to/from another website. 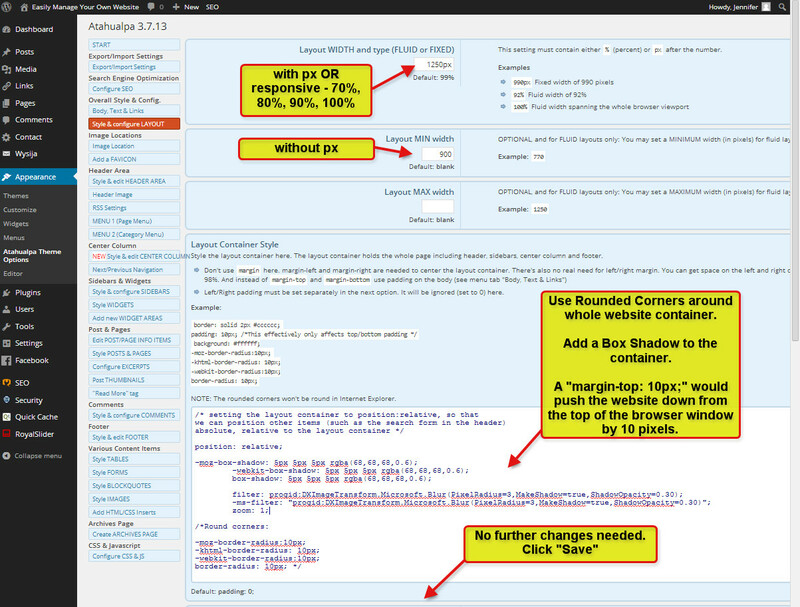 Configure SEO – You will be using a plugin for SEO. Change the color and look of any link (a clickable piece of text – usually with an underline) you insert into the body of pages or posts. Change the color that the link shows as the user passes their mouse over it. This should be changed to the width of your header picture – the average is around 850 pixels. This can be left alone. If you know about RSS you probably don’t need these instructions. However, if you are thinking about using RSS and have not used Twitter to it’s fullest capability, I suggest you start there. Because Twitter is so highly ranked with Google already, it is best to have links and followers on their site. Home link in Page Menu Bar – Delete the text in this field as you will create your own homepage. increases Google’s ability to crawl your site for keywords. At the bottom of the page, you can change the appearance of the borders around the sidebars (default is dashed 1px #CCCCCC;). Delete this line if you don’t want a border or change it to solid and specify a color. If you choose to only have one side bar, uncheck all boxes related to the sidebar on the other side (inner sidebars do not appear by default) and SAVE your changes. SEO – Make Post/Page Titles H1? Make the Post/Page Titles H1 instead of H2, and the blog title H2 instead of H1, on Single Post Pages and static “Page” pages? This gives the actual content more weight on their dedicated pages and downplays the weight of the blog title. On all multi post pages (such as homepage, category pages, etc. ), the post titles will still be H2 and the blog title will be H1. Hover effect for all tables?